Jewish wedding rings have a central role in each wedding ceremony celebrating the union of a couple for the long years to come. 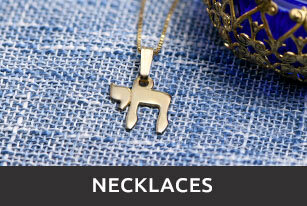 Selecting wedding rings which adhere to Jewish traditions will make the wedding perfect. After all, the wife or both husband and wife, will plan to wear that special wedding ring for the rest of their lives. Even more, Jewish law defines the wedding ring as part of the wedding; the vows or even a marriage contract are not sufficient to constitute a Jewish marriage! Jewish law dictates that a formal consecration must be made by the groom giving to the bride something of value that is whole and unbroken; today this is usually accomplished by the giving at the wedding a Jewish ring to the bride. 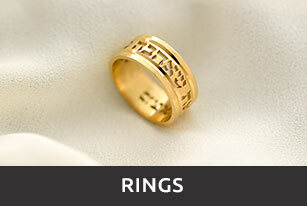 Simple gold (14K or 18K) is the preferred metal for the wedding ring or rings. Long ago, a coin equal to today's penny was given instead of a wedding ring or a pair of wedding rings. The coin was round and whole, symbolizing the unbroken circle that Jewish couple's wedding rings represent today in the wedding ceremony. Jewish tradition calls for the groom to present the bride with an unpierced metal band as a symbol of his promise of marriage to her. When doing so, he must recite the Jewish marriage formula in Hebrew. She must accept it, but is not legally bound to utter any words or do anything other than place it on her finger. Today, liberal Jews typically choose a more active role for the bride in the ring ceremony. Most commonly, a double-ring ceremony takes place, in which the bride reciprocates the groom's gesture. She will sometimes repeat the marriage formula as she presents him with a ring, with the gender of the formula adjusted accordingly. Even if the bride does not recite the specific formula, more often than not she makes some active gesture indicating her agreement to marriage. 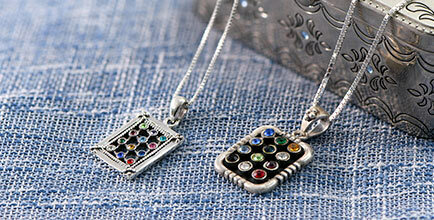 Jewish tradition prohibits the ring to be decorated with gems or stones. It should also be solid all around with nothing cut all the way through the ring. Engraving into or cutting away to leave upraised letters on the outside of the wedding ring is popular and interior engraving of the wedding rings is permitted. 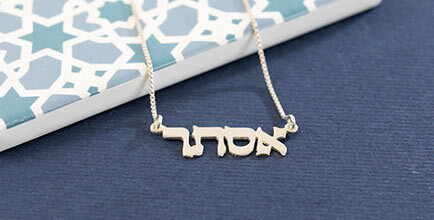 Many Jewish couples choose to have engraved a phrase or word, usually in Hebrew. The engraving or relief work, however, must not cut entirely through the ring at any point or it will not be considered "whole". 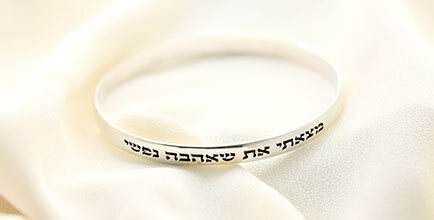 The solidity of the Jewish ring is a symbol of the commitment to the marriage, making it whole and eternal. 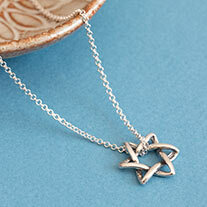 Unlike non-Jewish wedding ceremonies, only one ring is required to meet the Jewish wedding laws. That ring must be the property of the groom at the time of the wedding and is given to the bride. Non-Orthodox Jewish couples may choose to have a "double ring" ceremony. However, Orthodox couples may still have two rings - one for the bride and one for the groom - but only the bride will have a ring placed on her hand during the wedding. The Jewish groom's wedding ring would be placed on his hand at a later time, perhaps during the wedding night. In most ceremonies, the bridegroom will repeat a Hebrew vow when the wedding ring is given. The most common wedding vow is: "Behold, thou art consecrated to me with this ring, according to the laws of Moses and Israel." 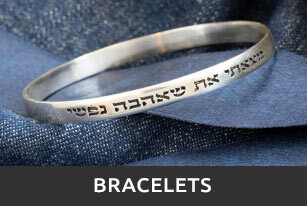 Other Jewish couples select a phrase of their own choice or creation and order custom-made wedding rings. Couples may choose to have the phrase on the outside of the band and may elect to have their wedding rings engraved inside with their names and date, or a special phrase meaningful to them as a couple. Of course, they could choose to leave the outside of the wedding ring unmarked and engrave a phrase only inside the rings. Whatever their choice as a couple, each time they look at their carefully selected wedding rings, the Jewish couple will recall all the love, care, companionship, protection, and support provided by their spouse, ever deepening their relationship.